ORLANDO, FL. — Getting to the Demo Day kickoff of the 59th PGA Merchandise Show wasn’t easy. There were traffic jams and long lines at the check-in points — even when the gates opened at the Orange County National Golf Center. The Demo Day was closed to the public and required a 45-minute shuttle bus ride from the Orange County Convention Center, the site of the last three days of the massive show — the biggest in golf. The PGA expected about 7,000 visitors to Demo Day, and attendees figured to hit about 100,000 shots on the 100-station range. Wednesday’s turnout, though, certainly exceeded that. One veteran PGA staffer, sitting with me on the early-morning bus ride, called the scene “amazing….bigger than I ever dreamed of.’’ And things got more hectic as the sunny day worn on, but there was plenty to see. Some bordered on the ridiculous. One company was offering a variety of multi-colored mouthwear. I didn’t realize your teeth needed protection in golf, did you? The bright colors, though, were eye-catching, and they weren’t limited to the mouthwear. ClubCrown by Vive showed off some dazzling covers that can be installed on the heads of drivers in 7-15 minutes. If your clubhead shows signs of wear or — if you just want it to look distinctive — try one of these covers. Anther company had club shafts in bright orange and lime green, and orange grips were available through another manufacturer. I also found a table-full of all-red golf shoes. The colors added to the festive atmosphere of the Demo Day, the ideal place for new companies to make a bang with their products. That’s really what that event is all about, though all the major manufacturers were out in full force to encourage the testing of their equipment on the big, circular range. Two products stuck out, as far as I was concerned. Ernst Sports displayed its ES12 portable launch monitor that provides video swing analysis, weather data, scoring details and even input for club selection. That handy little gadget will sell for about $225 when it hits the stores. 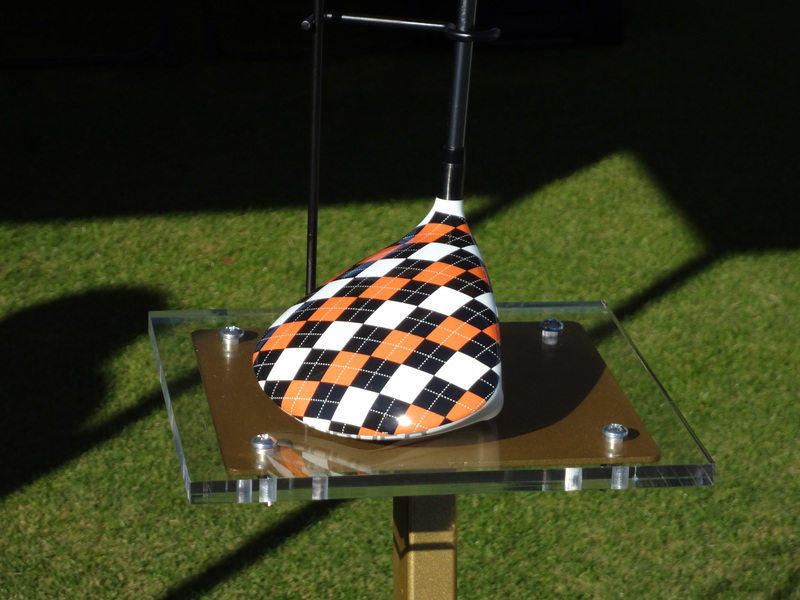 I was most interested, however, in the Heavy Putter put out by Boccieri Golf. Anything goes with putters, it seems, but the mindset in the production of this one is intriguing. I tested one of the many versions, and it was notably heavier than any putter I’d ever tried. The extra weight isn’t all in the head, either. It’s added to the handle of the club, as well, and Boccieri putters come in both standard and belly versions. The latter can range in length from 40 to 46 inches. Boccieri has been making putters for eight years, and belly models were among his original ones. Well, belly putters are selling now, though — in my book — their long-range future remains uncertain. And, there are plenty of other new golf products coming out that will challenge for attention.